The University Technology and Knowledge Transfer Forum has been started as a co-operation among seven universities in Hungary. The forum aims to support innovation processes in the institutions involved. The ceremonial signing of the agreement on co-operation was held at the Ministry for Innovation and Technology on 24 October 2018, with the participation of leaders of the universities concerned. In the international innovation competition, Hungarian universities also need to exploit effectively the social and economic benefits offered by research results. The first technology transfer offices were set up at Hungarian universities in the mid-2000s. As a result, the conditions and culture of intellectual property management and utilisation have been developed in these institutions by now. Over the past five years, regular co-operation has been maintained among the technology transfer offices of seven universities in Hungary. Their objectives comprise the development of their knowledge transfer activities, the effective utilisation of research findings, and the improvement of industrial co-operation. Due to the professional co-operation, many training programmes and conferences have been organised. Additionally, guidelines and recommendations have been formulated by professionals in order to improve innovation ecosystems around universities. On 24 October 2018, the universities involved in the co-operation, namely the Budapest University of Technology and Economics, the University of Debrecen, the Eötvös Loránd University, the University of Óbuda, the University of Pécs, the Semmelweis University, as well as the University of Szeged founded the University Technology and Knowledge Transfer Forum (ETTF). The signed co-operation agreement formalises this joint professional enterprise. The primary goals of the ETTF are to promote the third-mission activities of universities in Hungary, to raise general awareness of innovation, as well as to improve university-industry relations. As a professional advisory body, the forum will support a more efficient research utilisation with policy proposals. The ETTF is a member of the Association of European Science and Technology Transfer Professionals (ASTP), a working group bringing together the national networks of technology transfer. The event, which included a professional roundtable discussion, was held in the presence of Ádám Szigeti, Deputy State Secretary for Innovation at the Ministry for Innovation and Technology, Zoltán Birkner, President of the National Research, Development and Innovation Office, Viktor Łuszcz, President of the Hungarian Intellectual Property Office, as well as János Pakucs, Honorary President of the Hungarian Association for Innovation. 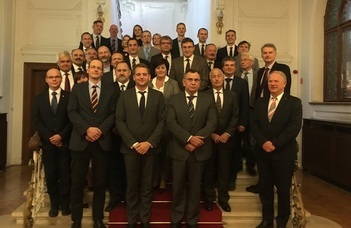 The Eötvös Loránd University was represented by Gyula Scheuer, Chancellor, Péter Szalay, Vice-Rector for Research, and Dániel Magyar, Director of ELTE Centre for Innovation.